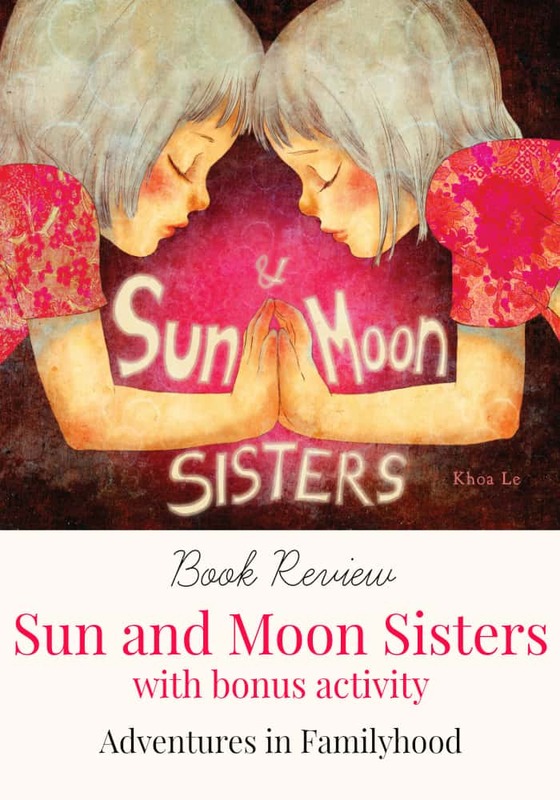 I received a free copy of Sun and Moon Sisters from Insight Editions to facilitate this review. All opinions are my own. There’s nothing like the bond between sisters. I know this for a fact. Having a sister myself, I understand just how beautiful the relationship can be. Unfortunately, no matter how tight sisters are, sibling rivalry does rear its ugly head from time to time. Who’s getting more attention? Who does mommy and daddy love more? Who is more special? I even see this jealousy in my own kids. Even though they are brother and sister, there is still that constant sibling battle. The new book Sun and Moon Sisters, explores this side of sisterhood. The author, Khoa Le, crafts a beautiful tale of sisters trying to discover who is more important. The Sun and Moon are sisters. Each possesses qualities that make them unique and well loved by the people of Earth. Even so, they were sometimes jealous of each other. They begin to wonder which is more important. Is one sister’s gifts better than the others? This disagreement leads the sisters to switch roles. At night, instead of going to bed, Sun stayed up, warming the Earth, turning the night into day. The children of Earth became hot and exhausted. During the day, Moon takes over for Sun. The children of Earth were confused by the darkness. Everything felt gloomy. In the end, the children beg them to return to their usual rolls, even though they haven’t figured out which one is more important. The sisters come to realize they are both important in their own way. They learn to appreciate each other’s gifts and continue to rule over the Earth in peach and harmony. There are so many teachable moments in Sun and Moon Sisters. First and foremost it opens up the discussion about jealousy between siblings. 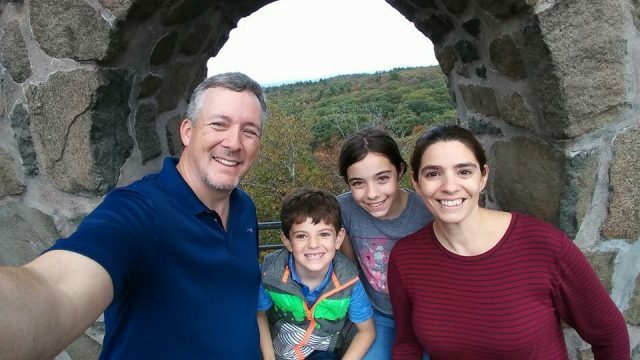 The book can help kids realize their own unique qualities and help them realize the importance of their role in the family. 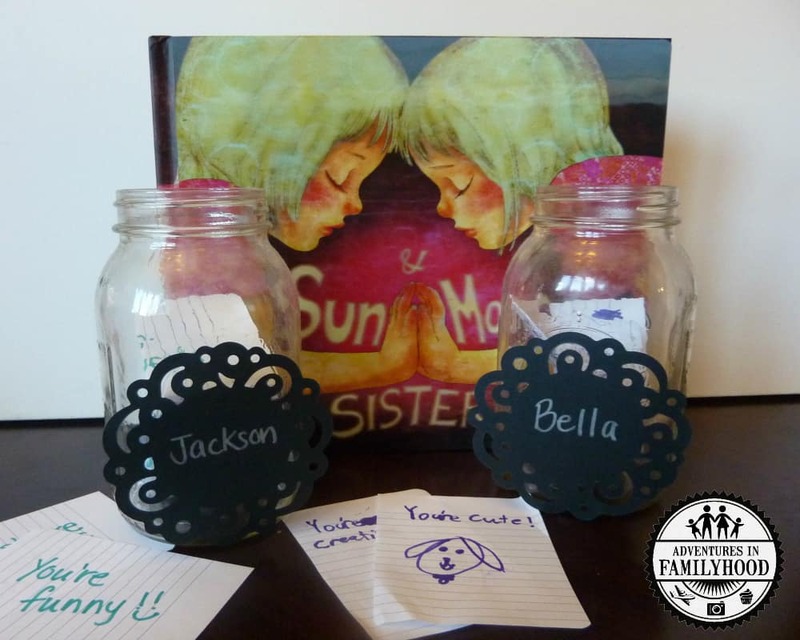 Mutual respect and harmony between siblings help keep families balanced. Sun and Moon Sisters also can help kids learn about the Earth. In the book, the constant sun wilted the plants and browned the flowers. On the other hand, the constant darkness caused animals to hibernate and the trees to shed their leaves. These two moments teach kids about seasons and how too much of one thing can throw off the balance in the environment. As parents, we know how hard it is to keep the peace between siblings. As a follow up to Sun and Moon Sisters, I came up with an activity to help my kids discover how special and important they are to each other. In the book, it is the children of Earth who help the sisters realize their importance. In this activity, siblings will tell each other in both verbal and written form, what they love about the other. I labeled two jars with my kids names. On tiny slips of paper, they each wrote (I had to write for the 5 year old) what they liked about each other. Once they were done, they shared what they wrote. I plan on using this activity for those times when jealousy’s green headed monster appears. This activity could also be adapted for classrooms. Sun and Moon Sisters is a great book for all kids. With its stunning pictures and beautiful story, it will surely become a touchstone text in many homes. It definitely will in ours. Thank you to Insight Editions and Insight Kids for providing us with a free copy of Sun and Moon Sisters to facilitate this review. For more information visit https://www.insighteditions.com.